Is Nature an important part of your life? If so, we have the ideal bag for you. This unique bag has a fabric this is lush with leaves, branches, and tree trunks. It will look wonderful with almost any tarot or oracle deck that includes illustrations with a natural setting or landscape. 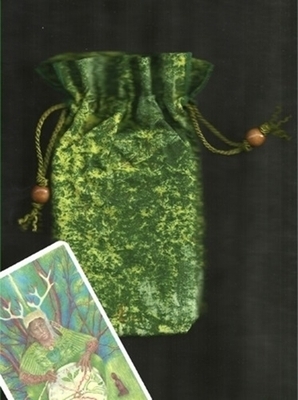 The Green Man Bag is shown here with cards from the Herbal Tarot and Harmonious Tarot. The bag is shown here, for color comparison, with a card from the Green Wood Tarot. Symbolism: The figure know as the Green Man is a Celtic figure of vegetation and plant life. He symbolizes the life that is found in the natural plant world and in the earth itself.